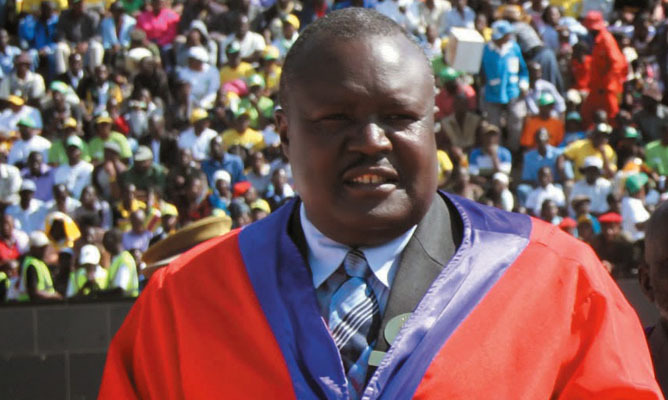 Chiefs Council president, Chief Fortune Charumbira, yesterday survived a planned ouster after he was voted by Masvingo traditional leaders to contest at national level for another term. Charumbira got 22 votes against Chief Serima, born Vengai Rushwaya's five. For the senatorial posts, the incumbent, Chief Chitanga, also won by 22 votes against Chief Nemauzhe's five, while Chief Nhema won by 21 votes against Chief Murinye's six. For the chiefs' council posts, Chief Chiwara won by 19 votes against Chief Musara's eight, while Chief Mazungunye won by 21 votes against Chief Ndanga, who got six. But before voting started at Chiefs' Hall in Masvingo City, Chief Murinye, born Munodawafa Murinye, and Chief Serima had complained of vote-buying and government interference. "There has been interference in the election process by government itself. Chiefs were selectively picked yesterday under the guidance of a government minister and given instructions as to how the elections should take place," Chief Murinye claimed. "The elections have been decided to an extent that the whole process is a window dresser. There are no elections taking place. The chiefs were given farming inputs. We are going to partake in the elections for the sake of it, but under protest." Chief Serima weighed in, saying retired soldiers had approached chiefs saying they were given instructions by President Emmerson Mnangagwa on which candidates to vote for. However, Zimbabwe Electoral Commission Masvingo provincial elections officer, Zex Zirabada Pudurai, who presided over the polls, said the chiefs were barking up the wrong tree and they should have taken the appropriate channels if they wanted to stop the elections. Meanwhile, Mashonaland East Senator and traditional leader Chief Musarurwa, real name Elias Masakwa, has declared his interest in contesting the position of president of the national chief's council, currently held by Chief Charumbira. Elections for the position will be held on July 18. Speaking on the sidelines of the provincial elections held at Mbuya Nehanda in Marondera, Chief Musarurwa, who won in the first round, said it was time to choose a traditional leadership that is dignified. "I am clear on my position. I am going to contest for the top post. We are in a new dispensation and we need new leadership. (Chief) Charumbira has a right to contest, but I am going to stand as well. "This is the time to have a traditional leadership that is dignified, not some pressure groups. We want to maintain dignity as well as promoting diversified cultures in our country, hence the decision to stand for the elections," he said.